I Heart My Glue Gun: BBQ Anyone? Oh, does it appear that I might think it's Father's Day? Well that's because my dear sweet Husband convinced me that in order for us to have a delightful Mother's Day tomorrow, we needed to barbecue. But, we have no barbecue. So what does that mean? We needed to buy one! That's right, we bought a barbecue so that I could have a barbecued meal on Mother's Day. 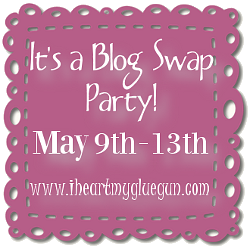 Don't forget about the Blog Swap Party going on this week! I have some lovely bloggers lined up to share some of their stuff with you! Happy, happy mother's day! I love that BBQ grill, it is beautiful! Following from Mingle Monday so I don't miss any more good stuff. LOL, jus like a man!!! Love the new grill though!! Came by thru the blog hop and I am a new follower thru GFC. I did not see any Facebook or Twitter buttons or I would have followed on those also. Hope you had a great weekend with an even better week coming up! I would greatly appreciate a follow back when you get the chance. Thanks! Stopping by from the Meet Me Monday Blog Hop...your newest follower via GFC :) Would *so* appreciate a follow back! That is hilarious!! Isn't it funny how men find reasons to get things they want?? We could do that, you know...if only we were men...but we;re women so we would never find a reason to want something that we loved...we have to look for something family oriented. :) Guess a grill counts. :) We love ours. I'm happy to be following oyu from the Mid Week Mingle.